Visitors to San Francisco during the holiday season often wonder what to do on Christmas Day. Many attractions are closed, but there's still much to do if you're not unwrapping presents with your family. Walk across the Golden Gate Bridge, San Francisco's number 1 tourist attraction. The walkway is open from sunrise to sunset. See Lombard Street, the "Crookedest Street in the World." Visitors flock to Lombard Street to see its gardens and curves. Don't forget that two blocks away is the steepest street in San Francisco - Filbert Street. 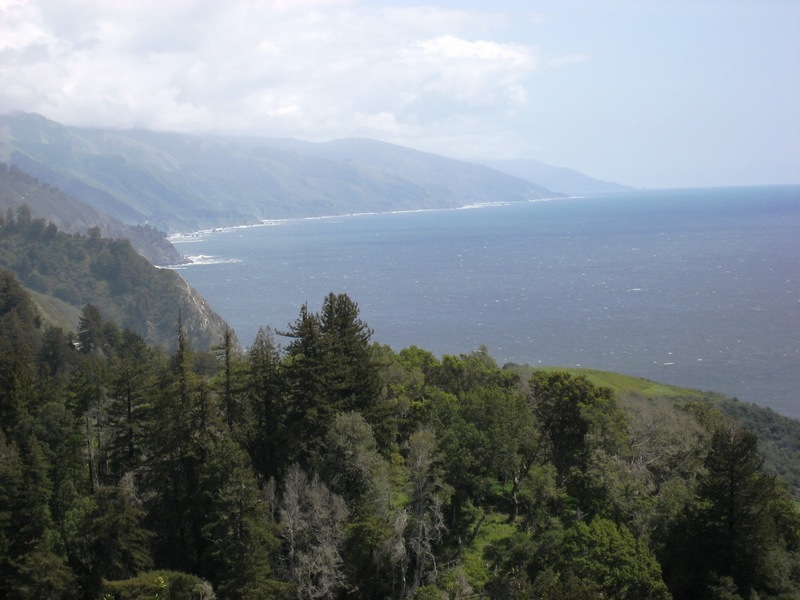 Explore Muir Woods, where you can see the Coastal Redwoods - the tallest trees in the world. 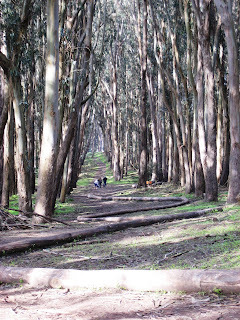 The park is located about 40 minutes north of San Francisco, across the Golden Gate Bridge. Visit The Contemporary Jewish Museum, which not only is open on Christmas Day but does not charge admission. Current exhibits include "Houdini: Art and Magic" and "Black Sabbath: The Secret Musical History of Black-Jewish Relations." The museum will be open from 11:00 a.m. until 4:00 p.m. on Christmas Day. Ride the cable cars. Travel over Nob Hill on America's first moving National Historic Landmark. Eat. Many restaurants are open on Christmas Day, including a good number in Chinatown. Take in a movie. Most movie theaters open around noon. If you are planning to go late in the afternoon or early in the evening, be prepared for crowds. As you can see, there are a number of things to do on Christmas Day. So there's no need to spend the day in your hotel room. One thing, you will not be able to do on Christmas, and New Year's, Day is take a tour with Blue Heron Custom Tours and Travel. We'll be closed on both December 25 and January 1 but will be open on all other days during the holiday season. Happy Holidays from Rick at Blue Heron Custom Tours and Travel. The November edition of "Rick's Tips" covers lighthouses along the California coast, from Sonoma County to the Oregon border. You can see this issue by clicking here. The previous issue of "Rick's Tips" was about lighthouses between Monterey and Marin Counties. The August 2011 issue can be seen if you click here. Combined, these two issues provide a good overview of lighthouses worth visiting along the Northern California coast. If you would like to take a private, custom tour that includes visits to some of these lighthouses, contact Blue Heron Custom Tours and Travel at (866) 326-4237 (toll free) or Rick@BlueHeronTours.com. The new Zagat San Francisco Bay Area Restaurants 2012 and The Michelin Guide San Francisco, Bay Area, and Wine Country Restaurants 2012 were recently released. So it's time for Blue Heron's annual summary of the critics' choices for the best restaurants in San Francisco and the Bay Area. Zagat's list of the five most popular restaurants includes Gary Danko, Boulevard, Slanted Door, French Laundry (Yountville, Napa Valley), and Chez Panisse (Berkeley). The top rated overall are Gary Danko and French Laundry with 29 points. Cyrus, Manressa (Los Gatos), Aubergine (Carmel), The Restaurant at Meadowood (near St. Helena, Napa Valley), Acquerello, Sushi Ran (Sausalito), Kiss Seafood, Chez Panisse (Berkeley), La Folie, and Massa's received 28 points. (All restaurants are in San Francisco unless otherwise noted). Once again, Michelin awarded three stars to the French Laundry (Yountville, Napa Valley) and The Restaurant at Meadowood (near St. Helena, Napa Valley). As in 2011, two stars were awarded to Cyrus (Healdsburg, Sonoma County), Coi (San Francisco), and Manresa (Los Gatos). However, three new restaurants received two stars this year: Benu, (San Francisco), Saison (San Francisco), and Baumé (Palo Alto). Thirty-nine restaurants in the Bay Area received one star. The "San Francisco Chronicle" awards four stars to the top restaurants. Current recipients are Chez Panisse (Berkeley), Cyrus (Healdsburg, Sonoma County), Manresa (Los Gatos), French Laundry (Yountville, Napa Valley), The Restaurant at Meadowood (near St. Helena, Napa Valley), Coi (San Francisco) and La Folie (San Francisco). Come to San Francisco and you'll have a chance to pick your favorite. Be sure to make your reservations well in advance as these top restaurants frequently fill up two months in advance. If you wait until the last minute, you may not be able to get a table or may have to dine at 5:30 or 10:00 p.m. If you want to see last year's summary, click here. When driving from San Francisco to Monterey and Carmel via the scenic coastal route, you pass by the Elkhorn Slough about 20 minutes before you get to the Monterey Peninsula. 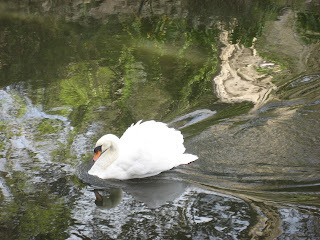 I'd passed by this waterway for many years and saw the signs for wildlife viewing. Recently, I ventured onto the slough with Elkhorn Slough Safari and was rewarded with views of a variety of marine life and waterfowl. We took a two-hour pontoon boat ride that departed from Moss Landing. During our ride, we saw 35 varieties of waterfowl including these gray pelicans pictured above. In addition, we saw over 40 sea otters, which represent nearly 2% of the entire sea otter population on the west coast. Pictured above are some of the 100 plus harbor seals we saw laying on the banks of the slough. The most plentiful of the marine mammals we saw were California Sea Lions. Most of the over 400 animals were fighting for space on docks and along the banks of the slough. As you can see from the photos, we had a bright, sunny day. I highly recommend venturing out onto Elkhorn Slough the next time you are in the Monterey area. This is a great activity for children, who are made most welcome by the Safari staff. If you'd like to visit Elkhorn Slough and Monterey from San Francisco, contact Blue Heron Custom Tours and Travel at (866) 326) 4237 (toll free) or Rick@BlueHeronTours.com to arrange your tour. 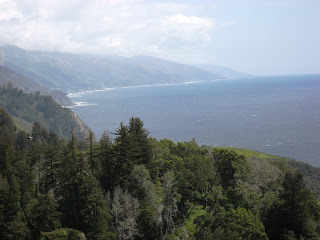 CA Route 1 through Big Sur is one of the world's most scenic drives. From Carmel to San Simeon is 90 miles, but you will need at least 2.5 hours to do the drive. You'll want to stop along the way to enjoy the ocean views, take a hike, browse in a gallery, or perhaps have lunch. Two restaurants along the route have beautiful ocean views: Nepenthe and Sierra Mar at the Post Ranch Inn. Deciding where to stop depends on your priorities: view, food, and/or price. While both restaurants have drop-dead views of the Pacific, Nepenthe does have the better view. Sierra Mar is situated so you can see endless ocean but not much coastline. From the deck at Nepenthe, you can see the dramatic meeting of coast and ocean. Just remember that, if you want to enjoy the view while you are dining at either restaurant, you'll need to stick with lunch except from late spring through summer. After the sun sets, the only sights might be a few lights from fishing boats. For food, Sierra Mar is far better than Nepenthe. Dining is more sophisticated at the smaller Sierra Mar. The food is more creative and the restaurant can take more care into its preparation since it is serving fewer people. On our recent trip to Sierra Mar, we had very good crab cakes, a fresh salad, and carpaccio. When we were at Nepenthe, we stuck with the very good and very large burgers. Nepenthe has sandwiches and salads at lunch while Sierra Mar also offers entrees. Both restaurants have a good selection of wines to accompany your meal. At both restaurants, you pay for the view. The burger costs $14.50 at Nepenthe and $22.50 at Sierra Mar. Sandwiches at Sierra Mar range between $16 and $22 and entrees cost around $25. Nepenthe's sandwiches and salads range between $14.50 and $23.00. During the height of tourist season, Nepenthe sees crowds of people. The restaurant only takes reservations for groups of five or more. Sierra Mar, being much smaller, encourages reservations. Which to go to? That's your decision. Can't decide? Spend a night in Big Sur and eat at both restaurants. Lodging at the Post Ranch Inn ranges between $595 and $2,285 per night. Fortunately, there are more affordable options, but most don't have the views. After driving by Point Sur Lighthouse for decades, I finally was in the area during one of the lighthouse's scheduled tours. We arrived 30 minutes before the tour was set to begin to make sure we wouldn't be left off as space is limited and advance reservations are not available. Shortly before the appointed hour, we were met at the entry gate by our friendly docent, James, who told us to drive about one mile to the parking lot where we met his wife, Linda, another docent. We then slowly climbed 300 feet to the top of the rock to the lightstation. Along the way, we stopped to catch our breaths and for James and Linda to tell us about the history of the lighthouse. When we arrived at the summit, we were rewarded with fantastic views of the Pacific coast and Santa Lucia Mountains. James and Linda then led us through the lighthouse and support buildings, telling us about the continuing restoration efforts at the lighthouse. We learned about the crash of an airship during WWII and the discovery of its remains in the ocean. The tour concluded at the visitor center, which had a variety of historic displays and a video of the lightstation's history. The three hours seemed to fly by. If you like history, lighthouses, and/or great views, I recommend a visit to the Point Sur Lighthouse. You may not get weather as perfect as we experienced, but you'll still enjoy the tour. Hours are limited, so check out the lighthouse's website for the latest information. When guests ask me where to go for Mexican food, I usually respond by suggesting they visit Mexico. Most of San Francisco's so-called Mexican restaurants consist of tacos, burritos, enchiladas, tostadas, and little more. It is hard to find Mexican restaurants in San Francisco that serve really quality Mexican food with the diversity of flavors and dishes one finds in Mexico. Last night, I stumbled upon Lolo in San Francisco's Mission District. This restaurant features contemporary, Mexican-influenced small plates. We had traditional dishes such as grilled prawns and guacamole with blue corn chips; innovative dishes like crab and chorizo tostadas, gorditas with braised short rib, and mahi mahi tiradito; and just simple grilled artichokes. The wine list is small but varied, featuring wines from South America, Spain, and California. Service was very friendly. The decor features recycled materials in a colorful display. We were told that the owner has a similar restaurant in Guadalajara and that the materials for Lolo's decor were brought up from Mexico. Being on 22nd Street between Valencia and Mission, Lolo is out of the way for most visitors. However, it is easily accessible by BART (San Francisco's subway system). Exit 24th Street, walk 2 blocks north on Mission and 1/2 block west on 22nd. You won't be disappointed. San Francisco has restaurants serving food from all over the world. My mechanic is from Tunisia so, being the good foodie I am, I asked him if there is a good Tunisian restaurant in San Francisco. He said Cafe Zitouna, on the corner of Sutter and Polk Streets, is the best. I tried going many months ago but showed up on the one day of the week the restaurant is closed - Monday. Today, I finally had a chance to sample Cafe Zitouna's food. The menu features a variety of Tajines (stews), which the owner said are similar to Moroccan tajines, and couscous dishes, which he said are like those made in Algeria. I tried the Loubia Tajine, a lamb stew with white beans in a saffron sauce. The meal was simple but tasty. Accompanying the tajine was a chunk of baguette to sop up the saffron sauce. The iced Moroccan mint tea was a refreshing accompaniment to the meal. The menu also includes a variety of appetizers and salads, kebab sandwiches and plates, and even breakfasts that combine North African and western ingredients. Being Halal, no alcohol is served. The decor at Cafe Zitouna is simple, and the prices very reasonable. The location is not one visitors are likely to find themselves, so you'll need to seek out Cafe Zitouna if you want to try Tunisian food on your visit to San Francisco. The restaurant is open Tuesday to Thursday, Saturday, and Sunday from 11:30 a.m. until 9:00 p.m. On Friday, the restaurant opens at 2:00 p.m. If you are planning to dine after 7:30, call first to make sure the restaurant has not closed early for the day. 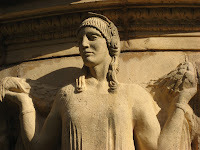 The latest edition of "Rick's Tips," Blue Heron's quarterly newsletter of fun things to do in San Francisco, the Bay Area, and Northern California is now available. The August edition talks about visiting lighthouses on the California coast from Monterey to Marin County. To see this edition, click here. The next edition, which will come out in November, will cover lighthouses from Sonoma to Del Norte County. I recently had a chance to take guests to Yosemite National Park, where we encountered spectacular waterfalls. The Sierra Nevada had above normal rainfall this past winter. With the spring being colder than usual, the June snowpack is about 190% of normal, making for large amounts of water still flowing over the cliffs late in the season. If you are in Northern California, try to get to Yosemite Valley to see the falls. Don't wait too long to visit. Even with the large snowpack, the falls will begin to dry up as we move further into summer. 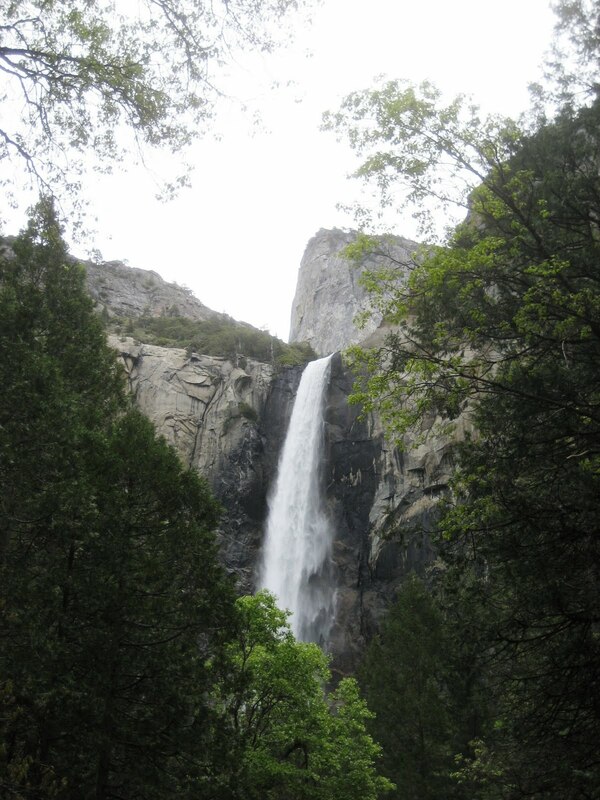 Yosemite Falls are usually dry by autumn and Bridalveil is just a trickle. For more information on Yosemite National Park, visit the National Park Service website. 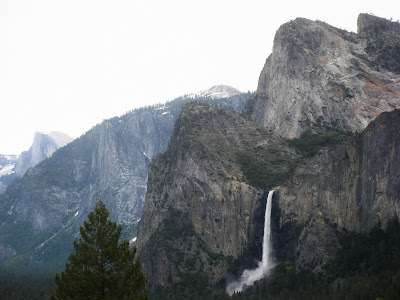 If you would like to take a private tour of Yosemite Valley from San Francisco, contact Blue Heron Custom Tours and Travel at (866) 326-4237 (toll free) or Rick@BlueHeronTours.com. The French distinguish between their bakers of sweets and their bread makers by calling the former "patisserie" and the latter "boulangerie." Similarly, the Italians use the terms "pasticceria" and "panetteria." In English, we have just one word: bakery. For the purpose of this post, I am just talking about bakers of sweets. While North Beach is the old Italian Neighborhood in San Francisco, two of my three favorite bakeries are French. La Boulange (yes, I know that's a bread baker) is a San Francisco chain of French-style cafes with salads, sandwiches, and delicious pastries. The North Beach Branch is 543 Columbus Avenue, between Green and Union Streets. Technically just outside of North Beach, since it is south of Broadway, is Brioche Bakery and Cafe. This small cafe also has salads, sandwiches, and wonderful pastries. The croissants are terrific! Brioche is at 210 Columbus Avenue between Pacific Avenue and Broadway. Lastly, Stella Pastry and Cafe has great Italian (and a few French) pastries. Be sure to try the Sacripantina, a multilayered cake made with sponge cake, zabaione, cream, rum, and other good things.. Stella is at 446 Columbus between Vallejo and Green Streets. If you have a real sweet tooth, you can visit all three bakeries in one short walk. If you would like to take a private tour of San Francisco that includes stops at one or more of these bakeries as well as other great bakeries or chocolatiers, contact Blue Heron Custom Tours and Travel at (866) 326-4237 (toll free) or Rick@BlueHeronTours.com. When I do my tours of San Francisco, I always tell folks a bit about the city's population and its diversity. The 2010 Census data are beginning to come out so I'll provide some population updates. California has about 37,250,000 residents. The nine counties that compose the Bay Area (Marin, Sonoma, Napa, Solano, Contra Costa, Alameda, Santa Clara, San Mateo, and San Francisco) have a population of approximately 7,150,000. The largest city in the Bay Area remains San Jose, with about 965,000 people. San Francisco's population is 805,000. About 33% of the city is Asian, 15% Latino, and 6% African-American. The remaining 42% is White. This marks an increase in the Asian and Latino population of about 11% since the 1990 census. Over the same period, the white population declined by about 12 percent and the African American population dropped by 23 percent. More information is available on the US Census website: www.census.gov. San Francisco has been diverse since its earliest days, when folks from all over the world came here for the Gold Rush in 1849. This diversity continues to this day. I finally had the opportunity to visit the Computer History Museum in Mountain View today. If you are into computers, you will love this museum. The main exhibit, "Revolution: The First 2000 Years of Computing" covers all types of computing devices from the abacus through the IPhone. Here you will get to see early mechanical computing devices, analog computers, games, primitive PCs, and many other devices from the history of computing. There are also exhibits and multimedia presentations on many of the unique individuals that contributed to the development of computers. The Computer History Museum is located about 45 minutes south of San Francisco and is open Tuesday through Sunday from 10:00 to 5:00. If you would like to take a private tour that includes a visit to the Computer History Museum, contact Blue Heron Custom Tours and Travel at (866) 326-4237 (toll free) or Rick@BlueHeronTours.com. 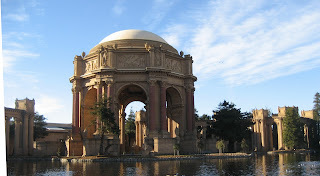 The latest edition of "Rick's Tips," Blue Heron's quarterly newsletter of fun things to do in San Francisco, the Bay Area, and Northern California, was released today. It focuses on travel in and around the Monterey Peninsula. You can read the newsletter by clicking on the title of this post. To receive your free copy of future editions of the newsletter, click on the subscription link in the newsletter. If you would like to take a private Monterey and Carmel tour, contact Blue Heron Custom Tours and Travel at (866) 326-4237 (toll free) or Rick@BlueHeronTours.com. Two years ago, I wrote about Andy Goldworthy's three pieces in the Bay Area. A new installation by the Scottish artist is now underway at the Presidio. 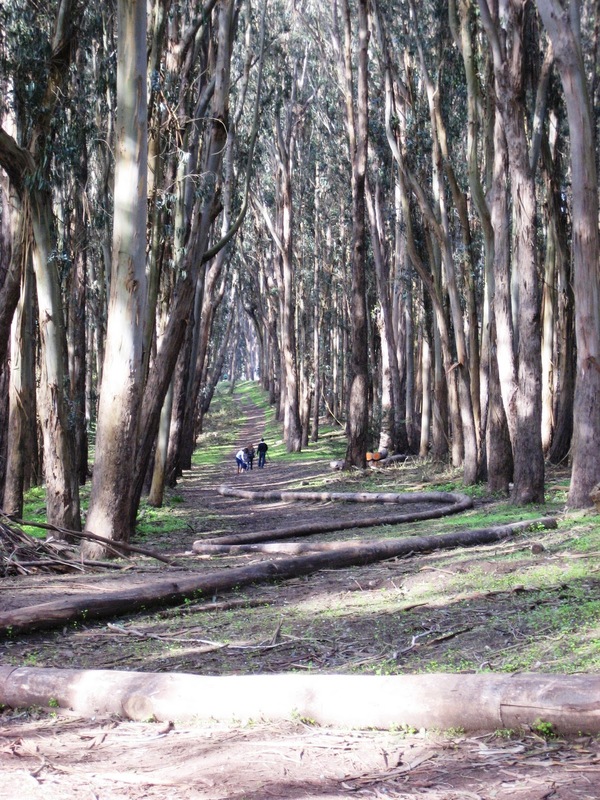 Wood Line is composed of eucalyptus branches connected in a curving line through the Presidio's forest where cypress trees failed to grow. 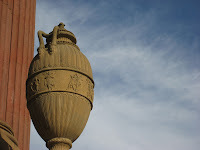 The above photo was taken from the south end of the work, near where Lover's Lane ends at the Presidio Gate. For more information on Andy Goldworthy's two installations at the Presidio, click here. To see my 2009 posting on Goldsworthy's three Bay Area works click here. If you would like to take a private San Francisco tour that includes Goldsworthy's three works in the city, Spire, Wood Line, and Drawn Stone, contact Blue Heron Custom Tours and Travel at (866) 326-4237 (toll free) or Rick@BlueHeronTours.com. 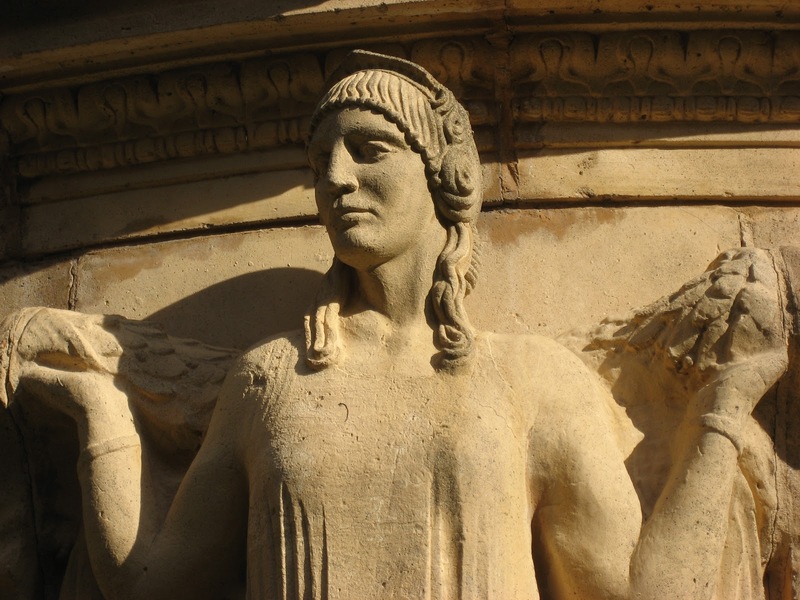 After an extensive renovation and restoration, the colonnade and rotunda of the Palace of Fine Arts will reopen to the public this Friday, January 14. Yesterday, I had a chance to get a preview of the restoration work. I am happy to report that the Palace has never looked better. The seismically strengthened structure has been cleaned and repainted, had new landscaping installed, and now more accurately reflects Bernard Maybeck's original Palace. The gold dome can be seen from afar, the rotunda is now safe to walk under, and the sculptures have been cleared of decades of grime. In addition, the lagoon looks terrific and is full of water fowl including three swans. If you have not visited the Palace in awhile, I highly recommend you walk on by. If the day is nice, have a picnic on the lawn by the lagoon. 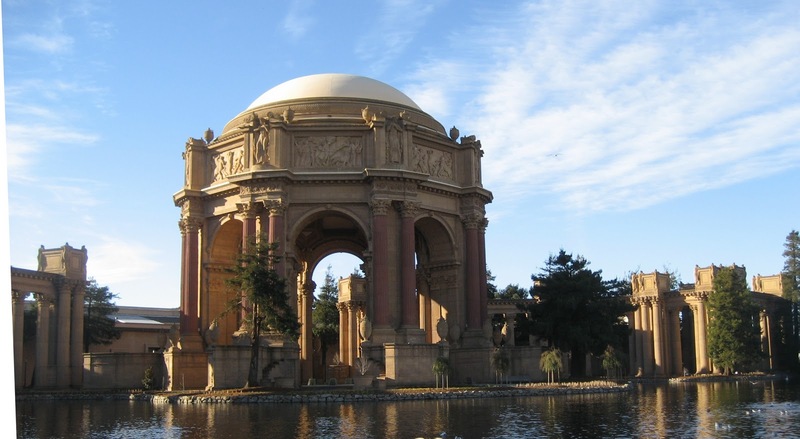 If you want to take a tour of San Francisco that includes a visit to the Place of Fine Arts, contact Blue Heron Custom Tours and Travel by e-mailing Rick@BlueHeronTours.com or phoning (866) 326-4237.